49 days. That’s how long you have left to train for the Nike+ Human Race 10K. Fortunately for some 240 NUS students, training seemed a little easier for them when MediaCorp artiste Joanne Peh and triathlete Ben Pulham ran alongside them in a 2.4km run last month. To help the runners on race day, Nike also introduced Nike+ enabled running shoes Nike+ Air Zoom Victory. 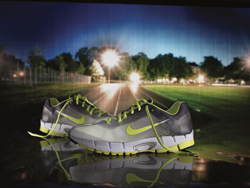 Dubbed in the press release as “one of the lightest and fastest training shoes Nike has created”, this pair of shoes promises to reduce weight dramatically while providing support that prevents injury and energy wastage, by limiting unnecessary foot movement. If you like what Joanne was wearing, you’ll be overjoyed to know that UrbanWire, together with Nike,is giving away 15 sets of Nike+ T-shirts. Simply drop us an email at contest.urbanwire@gmail.com with your name, contact number, mailing address, T-shirt size, and your opinions of Nike+ Human Race 10K. Please note that we may not have your size, and will give you the next closest size, if that happens. With this T-shirt, UrbanWirewishes all readers training for this race the best of luck. We will, of course, be with you in spirit. The Nike+ Human Race 10K will be held on Aug 31, 4.30 pm. Visit Nikeplus.com for more information, or to register your participation.